When Jefferson Davis — yes, that Jeff Davis — led the pre-Civil War survey for a southern route of the transcontinental railroad, Phoenix didn't exist. The Salt River Valley still lay in its centuries of enchanted slumber surrounded by wilderness. So the line was set in an arc north and west out of Tucson toward California. This necessitated the Gadsden Purchase from Mexico — otherwise, today's international border would be at the Gila River. But it also meant that what became the nation's fifth most populous city would end up without a mainline railroad. Even when the Southern Pacific was built across Arizona in the 1880s, Phoenix was a mere hamlet. It was served by a spur from Maricopa. By 1910, Phoenix was the territorial capital. With more than 11,000 people, it was fast overtaking Tucson as the territory's largest town — and with the Salt River harnessed by Roosevelt Dam it would become the center of huge agricultural production. The SP remedied this by building a northern main line up from Picacho Junction through Phoenix and west to where it joined the southern main just east of Yuma. It was a matter of competitive urgency, because the rival Santa Fe railroad had built a line to Phoenix (the Peavine) from its northern Arizona main at Ash Fork, and another that broke off west from Wickenburg to California. The SP's line was opened in 1926 and waiting for Phoenix's transcontinental railroad was the grandest building in this city of 48,000: the lovely mission-revival style Union Station. It's still there, at 4th Avenue and Harrison Street, the best human-made reminder I know of that Phoenix indeed has history and soul. Because of terrible short-sightedness of state leaders, it hasn't been served by Amtrak trains since the 1990s. It holds telecommunications equipment for Sprint, at once a horrid missed opportunity to create something great downtown yet it also probably the only reason it hasn't been torn down for something today's Phoenicians would consider majestic, such as a jail parking lot (Spring began as a Southern Pacific subsidiary). I was fortunate enough to see Union Station at the end of its glory days. Both the Santa Fe and Southern Pacific had wooden depots around Central (Center) and Harrison. Later, the SP built a slightly larger brick station. Finally, the two railroads agreed to build a depot more fitting the capital of the new state together. Union Station opened in 1923 at the foot of Fourth Avenue. For decades, it would be beating heart of the city, usually open 24-hours-a-day. The layout of the long arched building consisted of three pieces. In the center was the taller "headhouse" with high-ceiling passenger waiting room, snack bar, newsstand, ticket counter, Western Union telegraph desk, restrooms, and railroad offices. The design also featured two small offices bracketing the front entrance, for travel agents or tour operators. Attached to the east was an open-air, shaded waiting area. By the 1960s, this had been walled in for storage use by the railroads. The longer west wing was for baggage, the Railway Express Agency (the FedEx of its era), and the U.S. Mail (most mail moved by train). One stub track allowed for express and mail cars to be parked directly beside the west wing for loading and unloading. On the other side was a large parking area for Railway Express and U.S. Mail trucks, as well as other haulers. The station grounds were lushly landscaped with flower beds, hedges, and palm trees, as well as tall hedges that walled off the warehouses on the north side of Harrison Street. SP shifted all but one of its transcontinental passenger trains to the northern line as Phoenix drew more tourists and business travelers. Santa Fe provided passenger trains both to its mainline at Ash Fork via Prescott and to Southern California via the Wickenburg-Parker cutoff. Business was brisk in the 1920s — these were all trains hauled by steam locomotives. The Great Depression hit railroads hard, however, and traffic plummeted. 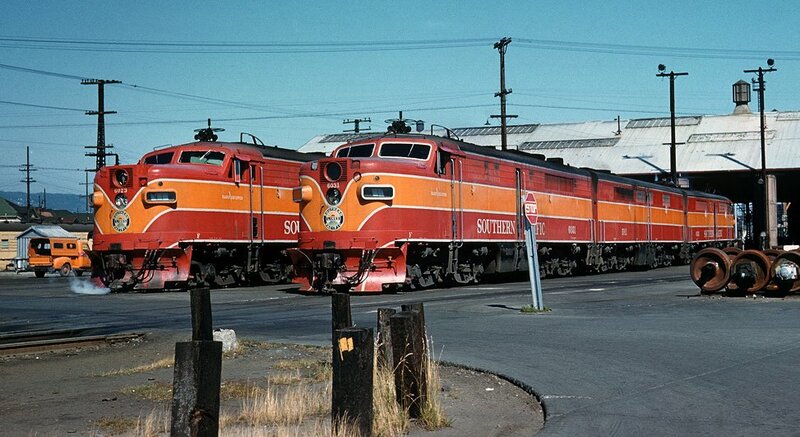 Many were forced into bankruptcy, although the large Santa Fe and Southern Pacific were survivors. World War II brought unprecedented demands on America's railroads to move both passengers and freight. With military training bases surrounding Phoenix, Union Station was the busiest in its history. (Union Station in this era figures prominently in my short story in Phoenix Noir). In the era before easy air travel and Interstate highways, huge numbers of Americans traveled by train. So there were also depots in every town of the Valley, including a handsome station in Mesa. In addition to the comings and goings, the stations often had the Western Union office. And the trains carried express and mail, a huge business. In each of these places, the depot was the center of activity, and none more so that at Union Station. At its peak, Union Station saw approximately 16 scheduled passenger trains a day, many more during World War II. Expecting the wartime boom to continue, railroads made huge investments in new streamlined cars and diesel locomotives with many amenities. Among them: dining cars with delicious meals served on fine china, parlor and observation cars with bars, coffee shop-snack cars, dome cars, barbers, beauticians, and onboard RN/hostesses. It was the golden age of train travel. Phoenix, for example, saw a fresh daily Sunset Limited pulled by PA-PB locomotives in the SP's famed "Daylight" design and silver passenger cars with a red band at the top. And for a time, the strategy worked. But the federal government heavily subsidized highways and airports, while it and states heavily taxed railroads. Still, even into the 1960s, Phoenix had convenient rail connections and American railroads served hundreds more cities and towns than would happen after the creation of chronically underfunded Amtrak in 1971. Let's take a look at a typical day at Phoenix Union Station in 1953, according to The Official Guide of the Railways. First up, at 5:30 a.m., was the crack Sunset Limited, flagship of the Southern Pacific, headed east to El Paso, San Antonio, Houston, and New Orleans. At 8:10 a.m., no-name train 44 pulled in eastbound to El Paso and Dallas via Bisbee and Douglas. Five minutes later, the westbound Sunset stopped on the way to its 4:30 p.m. arrival in Los Angeles. Santa Fe's service had dwindled to only one daily varnish, Train 47, nicknamed the Hassayampa Flier. It arrived at 8:30 a.m. from Ash Fork, where it connected with the Santa Fe's legendary lineup of streamliners, including the Super Chief, Chief, El Capitan, San Francisco Chief, and Grand Canyon. At 11:20 a.m., the eastbound Imperial arrived on the SP. Then Union Station's baggagemen and other employees had a few hours to catch up. Action picked up again at 5 p.m., when Santa Fe No. 47 departed for Ash Fork. Before the 1960 Paulden Cutoff, the train also served Prescott, which was a busy railroad town. Soon the LA-bound Imperial arrived, carded for 5:25 p.m. As evening came, SP's Train 43, the westbound version of No. 44, arrived at 7:55 p.m. Finally, another crack streamliner, the Golden State Limited came through at 10:35 p.m. eastbound and 11:45 westbound. The Golden State ran between Los Angeles and Chicago on SP's Sunset Route to El Paso, then the Golden State route to Tucumcari, N.M., where SP handed off the train to the Rock Island railroad. In the case of both Southern Pacific and Santa Fe, in addition to carrying coaches and Pullman sleepers, trains also handled plenty of head-end express and mail. On the SP, Phoenix was a major switching point for setting off of picking up these revenue-rich cars. A daily Fast Mail consisting of only boxcars and baggage cars of mail, along with a railway post office (RPO) car, stopped at Phoenix. Many passenger trains also carried RPOs, staffed by U.S. Mail employees, with mail sorted on the way. At tiny stations, the RPO would pick up or drop off mailbags "on the fly." The crack streamliners could run 14 or more cars. The Union Station track layout went like this: One stub end for mail and express on the west side closest to the station; another stub on the east side for sleepers or business cars laying over; five through passenger-train tracks with brick-and-concrete platforms separating two tracks each; a bypass to the southwest for freight trains, as well as for stub tracks to the SP's coach yard and maintenance facility. The Santa Fe serviced its passenger equipment at Mobest Yard, Fillmore and 19th Avenue. Across Lincoln Street to the south was a large natural gas storage tank. The trackwork got complicated as Phoenix and its Warehouse District grew. Southern Pacific took over and expanded its old depot at Central Avenue (after the late 1930s an underpass carried the road under the tracks) into a freight station. This had multiple tracks to accommodate boxcars carrying the "less-than-carload" freight that was a lifeblood of the railroads for decades. Between Second Avenue and Third Avenue, the main line curved slightly and opened into the mouth of Union Station's track layout. To the west, Santa Fe's freight station was located at Fifth Avenue and Jackson, with a ten-track yard, small turntable, and overhead hoist. Another line ran along Jackson for switching warehouses, and yet another was ultimately put down directly in front of Union Station on Harrison. Together, these operations constituted the heart of the city's commerce and the source of hundreds of jobs. By the time I came along, what had once been the world's finest passenger rail system was in its death spiral. Yet I fell in love with the building at first sight (I was probably three). From the front, it had Union Station spelled out in letters curved over the center arch (still there) and a sign below saying: Southern Pacific -- Santa Fe (now gone). Trackside, I vividly remember turning back to look at the entry arches and learning for the first time that my city was spelled with a "Ph." Throughout the 1960s, thanks to my indulgent mother and grandmother, I spent as much time as I could there. Even when I couldn't be there, I enjoyed calling the recorded station line, listing the day's arrivals and departures. The depot was showing signs of its neglect, in faded paint and other disrepair. By this time, disenchanted SP management was trying hard to kill its passenger trains. Still, it was an amazing building full of excitement and history. If you walked around to the east of the waiting room, you saw the train dispatchers' office with old-style phones on accordion extenders from the wall. "Trainmen Only" was etched on the door, probably from thirty years earlier. Every day, a few minutes before noon, the office received the official time — time bring critical to safe and efficient train movement — and clocks and watches were set accordingly. Up front, the shady area inside the depot's opening arches held an office on either side. I recall one was an SP travel agent, and the other was a barber. The waiting room was large (to a child) and airy, with the ticket booth on the west wall and a sundries shop and snack bar on the east. The benches were wooden, comfy, substantial. It was still busy at train time, and all sorts of people wandered through. The air smelled of cigars, cigarettes and the sweet scent of locomotives. Train announcements were made over a P.A. system. Through the three sets of double doors lay the tracks, as well as the schedule board for trains. Trains there were, even at this late stage. SP ran two of its premier transcontinental trains every day: the Sunsett between Los Angeles and New Orleans, and the Golden State between LA and Chicago. In addition, there was a long mail train with one or two coaches at the end, the remnant of another crack train, the Imperial. Another train, the budget Californian, had already canceled in the 1950s. The elite Arizona Limited from Chicago lasted only two seasons in the late 1940s. Santa Fe originated a train in Phoenix that connected every day with its legendary mainline trains in northern Arizona. An earlier train had also connected Phoenix to Barstow via Wickenburg and Parker, but it was gone by the 1960s. For much of the day the station was busy, especially in the early 1960s before the Sunset and Golden State were combined. Pullman sleeping cars from Chicago and points east were set out and picked up during winter. Mail and express cars were switched into position to be picked up, or shuttled to be unloaded. The entire long west wing of the station was still occupied by the U.S. Mail and the Railway Express Agency. Their trucks were packed into the lot on the north side of the building. The transcontinental trains were long — 14 gleaming streamlined cars in the early '60s, and sometimes still led by diesels painted in the SP's famed Daylight paint scheme. Passengers getting off were greeted by grass, hedges, flowers and palm trees, especially on the east end of the station area. Of course it wasn't a grand gateway to the city -- that idea had been neglected. But in the early and middle 1960s, downtown was still alive, diverse and a major shopping district. And the oh-so-cool Deuce was nearby, a siren for any kid who wanted to sample nonthreatening edge and danger. Even in the 1960s, Union Station anchored one of the city's most vibrant and important economic hubs. The Valley sent huge trainloads of produce and vegetables back east. Produce handling and shipping operations, as well as distribution businesses and farm-related supply and manufacturing businesses, were spread along the tracks for blocks in both directions. Tracks ran along Madison and Jackson streets, so refrigerator and box cars could be shunted into place at the warehouses. The Santa Fe freight station was graced by a blue neon "Santa Fe" sign on the roof — a remnant of the building is incorporated into a county parking garage today. Trains and trucks vied for position during the busy weekdays. The two railroads also interchanged freight cars here. South of the passenger-track grid, the SP had a bypass track for its freight trains (now ripped out) and this line was busy. Sadly, I can find no photos of this amazing show. But you can get a sense of its size by driving over the overpasses at 7th avenue or street -- all that space beneath these large spans was occupied by railroad tracks. I still have magic memories of crossing the 20 or so tracks on 7th Avenue before the overpass -- we were sure to be stopped by a train. The railroads themselves were big "economic engines" as a later age would put it, employing thousands of union workers making excellent wages and operating rail yards and maintenance facilities. I had a chance to ride every train, if only to Tucson and back. The little Santa Fe train that by this time departed promptly at 4 p.m. every day held special appeal. Our class from Kenilworth School rode from Union Station to the depot in Glendale as a field trip. I was an old hand. At age six, I was allowed by an engineer into a locomotive cab — my grandmother was the wife and mother of railroaders and was accorded special treatment always. She and I took the train several times north. Although we were too poor to get on one of the flashy streamliners that ran between Chicago and LA through Flagstaff and — by the 1960s — Williams Junction, the Santa Fe treated us first class. In the busy season, the train had a sleeping car and a diner, with service Amtrak can't match. At every stop north, whole little towns seemed to turn out for the train — I especially remember the crowd at tiny Skull Valley. All around us was the empty glory of unpopulated Arizona. We would change to another Santa Fe train at Williams Junction that headed on a branch line north. From the window of that train I got my first glimpse of the Grand Canyon. (Theodore Roosevelt: "Leave it as it is. You can not improve it. The ages have been at work on it and man can only mar it. What you can do is keep it for your children, your children's children, and for all who come after you..."). Such are one kid's memories. When I die, so will they. I suspect only a tiny minority of my contemporaries who grew up in Phoenix ever had these experiences. Their kicks came from sitting in the river bed at 40th Street on the edge of Sky Harbor and watching the jets land overhead. Union Station represents bigger things, too: The relentless destruction of railroads by national policy of subsidizing cars, trucks and airlines. The loss of more scalable economies, represented by the "less than carload" freight carried to every city by rail and delivered to freight stations. The chance to build a more balanced transportation system for a future of higher energy prices, worsening urban congestion and climate change, rather than our reliance on trucks, cars and planes. The killing of agriculture, the oldest human activity in the Salt River Valley and a valuable source of exports and economic diversification. Arizona's self-destructiveness is not preserving the northern main line and Amtrak service to Phoenix or using Union Station for commuter service (also a foolish, bean-counter decision by SP/Union Pacific, resulting in terrible service problems in the 2000s). The misbegotten nature of Amtrak when just subsidizing the private railroads and maintaining the mail contracts most likely would have yielded a better system. The Santa Fe never allowed Amtrak to use its train names (such as the Super Chief) because the service was not up to Santa Fe standards. Santa Fe brass later reflected that they might have done better just keeping their passenger trains going. Now America barely has a train system outside some corridors, including California, and it lags the advanced world in the sustainable future: high-speed rail. And Union Station, like the Westward Ho, once the grandest hotel in town, represents Phoenix's tragic inability to capitalize on its historic icons. Still, the building remains. Now it sits amid blight, the hedges and flowers long gone, most of the palm trees dead, the network of tracks mostly ripped out and sold as scrap so China can build its economy. It sits dwarfed by the large, dull modern buildings of downtown Phoenix. It is more beautiful than all of them. The two railroads serving Phoenix had separate depots prior to the opening of Union Station, each located at Central Avenue and the tracks. This is the Southern Pacific's station in 1909. It went on to become part of the SP freight station, handling "less than carload" freight in boxcars into the 1960s. Santa Fe passenger trains at the brand new Union Station in 1923. Three years later Southern Pacific completed its Northern Main Line and diverted most of its passenger trains through Phoenix. The San Diego Chamber purchased an ad to mark the opening of the Phoenix main line in 1926. The real main line went to LA and San Francisco, but a secondary line, through spectacular Carrizo Gourge, allowed for passenger trains to reach San Diego from Phoenix. Trackside, the south side of Union Station, in 1930 (McCulloch Bros. collection/ASU Archives). Train time in the steam era, with two passenger trains arriving. (McCulloch Bros). The west side of the building at trackside. Note the baggage wagons. (McCulloch Bros.). In the 1930s, horse-drawn wagons and small delivery trucks loaded and unloaded on the mail-express wing of the station. By the 1960s, the area was still packed with large mail and Railway Express trucks and semis. The east side of Union Station, featuring many of its mission-style flourishes. In early decades, the east end was an open-air waiting room with benches until it was walled off and used for storage. (McCulloch Bros.). An overhead shot of the station with a train and a switch engine. Note stub the express track at the left and the other stub on the right, which was used for Pullman sleepers and railroad business cars laying over. The freight bypass is the track angling southwest at the bottom of the photo. Also note the sidings serving warehouses. The railroads aggressively promoted Phoenix to eastern travelers, but also to Phoenicians wanting convenient trips to the West Coast. A 1921 ad for The Phoenix, direct to Los Angeles via Parker and Barstow. One of the first diesels to serve Phoenix is on the head end of the Santa Fe's famous Super Chief in 1939. The train, launched two years earlier, normally ran on the railroad's northern Arizona main line. It was making a promotional visit to the capital city. Sleeping cars were carried between the Super Chief and the other streamliners to Phoenix on the local trains that ran through Prescott. By this time the station grounds have been landscaped with palm trees, hedges, and flower gardens. The Morrell family prepares to board a new lightweight streamliner car in 1940. (McCulloch Bros). People waiting to board trains or greet arrivals, 1954. Santa Fe train 42, informally called the Hassayampa Flyer, arrives at Union Station a little after 7 a.m, circa 1960. Connecting to the ATSF main-line passenger trains at Ash Fork (later Williams Jct. ), it could carry baggage, chair cars, diner and sleepers when demand existed. It will be backed to Mobest Yard on 19th Avenue to be cleaned, serviced, and turned before its 4 p.m. departure. By 1961, eight trains a day still served Phoenix. Outside the main entrance, mail boxes and telephone booths had been added. You could also send a Western Union telegram any time day or night. Santa Fe's last daily train to Phoenix, the Hassayampa Flyer, has just arrived from Williams Jct. in the 1960s. It's the off-season, so the train is down to two cars. It's 1968 and a much diminished Sunset Limited boards passengers. Note the green Railway Express Agency trucks loading at the right. Meanwhile, Santa Fe cars await a diesel to take them north. A large crowd greeted the Turbo Train on its national tour in 1971. Billed as the train of the future, it only ran in the Northeast. The Sunset continued to serve Phoenix under Amtrak until June 1996. By the time of this photo, the former open-air waiting room is long gone and most of the building houses telecom equipment for Sprint, a spinoff of the Southern Pacific. The waiting room was restored in the 1990s. At the far wall was once a lunch counter and newsstand. The depot as it is been since being fenced off since the 2000s. Think Phoenix has no history? Check out the entire Phoenix 101 archive. I was in Tennessee a few years ago checking out the remnants of America's glorious past. In Nashville, the old train station, a stunning gothic pile, now houses a Wyndham Hotel. In Chattanooga, the train station incorporates Pullman cars in a kind of hotel/railway theme park. In Memphis, the grand beaux-arts train station was torn down in the late 60s for a postal annex. You can imagine what that looks like. The damage that cars have done to this country are beyond calculation because there's no metric that can quantify the visual horror of most American cities. Most of us just accept it as a given, as if Europe was destined to be "quaint" while American cities were destined to be zippy. But prior to World War II, most American cities, including Phoenix, were much closer to the European model. And what we gave up in the name of prosperity and personal mobility should - and does - haunt our dreams. I wish nostalgia worked but it just makes us cranky. Kunstler's jeremiads about the American crudscape are thrilling to read because they're so obviously right and gloriously angry. But we're stuck now with an infrastructure too expensive to revamp and ultimately too expensive to maintain. How we navigate the future is anyone's guess. I'm guessing it won't be pretty. I am an Arizona native (born in Tucson in 1976) who lived in the Phoenix area from age three until 27, when I left for a job in Boston. I witnessed the changes that occurred as the "Valley" grew rapidly during the 1980s through my 2004, when I left town. I still remember those green welcome signs that greeted motorists as they entered Phoenix, announcing the city's population at 885,000. To an 8-year-old kid, that was a staggering figure. On a side note, motorists who were about to leave Phoenix were bid goodbye in Spanish on identical-looking green signs: "Adios, Amigos." During the 1980s, my old man owned a business adjacent to the steel mills just west of the State Capitol. When school let out at St. Theresa, I took the city bus to the main terminal on Central. He picked me up and I would ride with him as he visited job sites across the metropolitan area. Occasionally, we would pass by Union Station, which at the time, had passenger-rail service. I never got to visit the inside of the station, but I was always curious what it looked like, and for that matter, what it was like to ride a train. I always thought the exterior of the station was beautiful. I love reading Jon's Valley 101 columns; as someone who grew up in the city, they remind me of what made Phoenix a great city (the citrus groves, the Japanese Gardens, the untouched desert just beyond Phoenix's northern border, Bell Road) and sadly, what has contributed to its devolution: the Arizona Legislature, the influx of people from other parts of the country who don't care and just want to be left alone and the loss of influential business leaders and groups such as the Phoenix 40, which worked hard to diversify the region's economy and bring high-paying jobs to the area. I was 18 years old in 1965 when I came to Phoenix to check out ASU and returned to Illinois via train and left from the Union Station.It was December and I had a wonderful 3 day trip with lots of time to write a term paper that was due and relished the dining car experience.The day before I left,they released water into the dry Salt River that I had driven through earlier in the week and as the train crossed the river in Tempe I thought "what kind of nuts build roads in riverbeds? "I later did work at the station when they refurbished in the 8o's or 90's and it was a beautiful old building still then.It brought back a lot of good memories that I will always cherish about Phoenix. Thank you for this bit of nostalgia. It doesn't make me "cranky" -- in fact it makes me rather jolly. In fact, the joyful experiences of yesterday can inspire both hope and vision for the future, if we but allow it. To permit memories of the past to die, through cynical neglect and lack of hope -- truly, only then will the sterility of the desert triumph. A man without a past, yet advanced to middle-age, is surely a man without a vision. Let's not allow ourselves to be reduced to mere dry husks of resentment and lost opportunity. As long as beauty lives in the mind and soul there is hope for the future: for these are the eternal springs by which the sterility of the desert is watered and made capable of supporting the gardens of the future. Such beautiful prose Mr. Pulsifer. Thank you for the inspiration. Emil, that was poetry! It is so tempting to join the "Ain't it Awful" society, but the cost of membership can be corrosive cynicism. When I worked for Phoenix FD, I inspected the new generators installed at the Phoenix Union Station. It is a really interesting building with some very unique architecture. I always wondered why the City didn't purchase the building and use it as part of the city's history. Your history information was very helpful. Thank you for sharing it. I am 28 years old and have lived in Phoenix for 23 years. Jon's writing is the only place I have ever seen Phoenix's Union Station even mentioned. How sad is that? Being a product of the 1950s and 60s post-WWII U.S. migration west, our family moved to Scottsdale from St. Louis in 1960. My dad received his Ph.d from Washington U. but took a teaching position at ASU. As a 6 year old I remember the Phoenix train station-- we would pick up St. Louis friends who had taken the train to visit. It was a cool place. I remember the benches and windows with smoky shafts of sunlight coming in and the hustle and bustle of the passenger lobby. Not long after, Sky Harbor became the hub to travel from, although I have fond memories of the old terminal building there as well. It is sad to see the station in its present form, tucked behind the 4th Ave. jail, buried among the new buildings. It screams to be restored, if only as a train museum, or something of the like. A wonderful post, Jon--your memories of Phoenix Union Station are similar to mine in many ways. Due to the current lack of passenger train service between Phoenix, AZ and Las Vegas, NV, I'd like to propose that new train tracks be constructed in two segments, which would therefore enable a direct train path connecting the two cities. One segment of about 63.5 miles would begin with a new connection at Nipton, CA (located along Amtrak's old Desert Wind route south of Las Vegas, and continuing via Laughlin, NV and then to Needles, CA. From there, follow existing tracks some 12 miles along the route of Amtrak's Southwest Chief to a point just past the existing rail bridge over the Colorado River near Topock, AZ. The second segment of required new rail tracks of about 58 miles would continue from Topock to Lake Havasu City and then Parker, AZ. Existing tracks at Parker continue to Wickenburg and then on south to Glendale or Phoenix. Total estimated new track mileage: ~121.5 miles.